How can I get rid of this anonymous app? I have just found an app in my apps menu (pictured below), but it doesn't have a name or proper icon. I have looked in the app info menu in settings, but I can't see anything. Go to app store and see if there is an app which is on hold and has not been downloaded yet. It might have some error and so is stuck. Else scan your phone once. It can be a malware. I don't know why this fixed it, but A bochur's suggestion to restart my phone has removed the app from the app menu. If someone know what caused this behaviour I'd be grateful to know, otherwise: case closed. Not the answer you're looking for? Browse other questions tagged uninstallation app-icons or ask your own question. Unknownn, unnamed and blank icon app show up in app drawer? 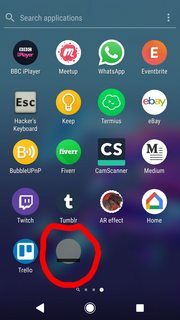 How to force retrieving app icon for apps downloaded from Google Play? com.newrelic.agent.android: how to get rid of it? What are the tiny superscript numbers on home page buttons?